These perfumes were sent gratis from Femme Fatale in exchange for photography. As always, all opinions are my own. 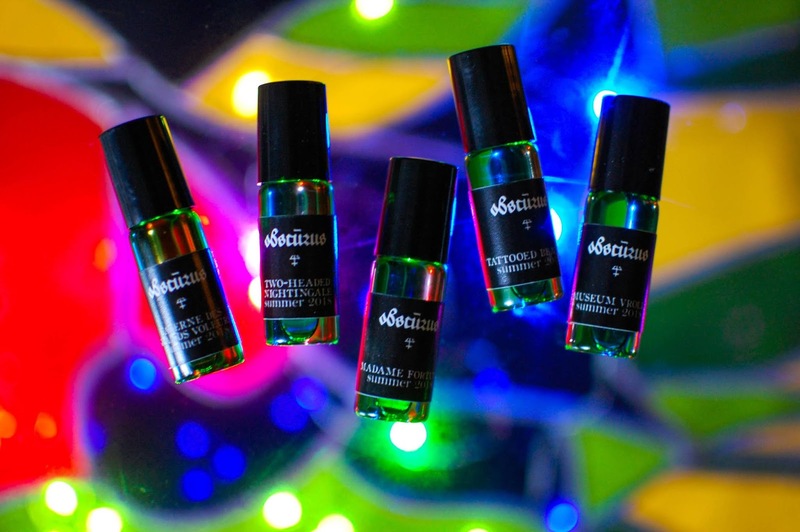 Last week I shared the Obscurus Freakshow wax tarts and today I am going to share with you the personal fragrances, which are all different scents than the tarts. They hover around $15 after the Australian exchange rate. I like the originality of the green glass bottles. Their little roller balls are conservative with dispersing the perfume so they keep me in check, well, mostly. I still roll it like crazy all over my arms, chest and belly like a kid with a toy car. At least I don't make the "brrrrrrrrRRRRrrr" sounds when I do it. Yet. The summer Freakshow Collection was inspired by vintage "freakshow" aesthetic- extraordinary conditions, human oddities and performances that were considered "shocking" to viewers at that time. Sounds like my kind of collection! Caverne Des Grands Voleurs- Notes: Warm amber, agarwood, aged patchouli and a shot of mellow cognac. "The Cavern of the Great Thieves" was the forerunner to Madam Tussaud's Chamber of Horrors. Lightly spiced and woody patchouli catch my nose first, then a fizzy boozy amber rolls along the spine of the sepia patch. A papery parchment tone emerges from the patchouli then folds back into its cognac warmth again. Lots of movement in this one but it all pivots from that gorgeous aged patchouli, a sensuous smoky patchouli. It does get a touch darker from the agarwood. I love that burnished oudh fragrance. This is a beautiful scent that does stay relatively close to the skin and has a nice longevity of several hours. Two-Headed Nightingale- Notes: Violet florals, musk, caramel, vanilla, a dish of strawberries and satin sheets. Named after Millie and Christine McCoy (July 11th, 1851- October 8th, 1912), American conjoined twins with the stage names "The Carolina Twins", "The Eighth Wonder of the World" and "The Two-Headed Nightingale", traveled throughout the world performing song and dance. Tender blushing wild strawberries sprout along the forest path in tandem with tiny sweet violets. Their timid creeping ground cover initially makes them easy to pass by, the abundant green leaves obscuring the delicacies that dwell within. However, their perfumed exhalations drift upwards and entice a second glance. The perfume turns from wild and lush to sweet and candied. Crystal sugars and vanilla musks slink in and create a sugared strawberry musk. It fluctuates between being a gauzy light pink and gaining opacity into a juicy deep pink, like swirling strawberries and cream. It dries into a delicious vanilla sugar musk with a subtle tint of pink. 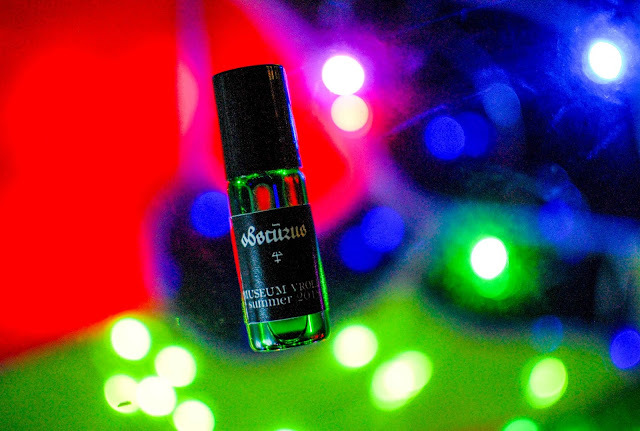 Madame Fortune- Notes: Sweet musk, vanilla, myrrh, black currants, velvet and violet crystals, and a hint of tobacco. Enter through draped doorways, crystals tinkering, into warm candle-lit darkness. Madame Fortune beckons you closer to show you your future. Vintage violet cosmetics and tartly sweet currants bobbing in a Diablo cocktail curl from the edge of the curtained tent. Pulling the beaded fringe aside reveals that the cocktail has been swiftly imbibed and the violets bloom ever more lush and realistic. Suddenly they are joined by green leaves hanging in the corners of the tent and a small brass censer lightly scenting the air with expensive incense. The violets play on in a light halo, perhaps the violet water used to cleanse the lady at the small table's hair. 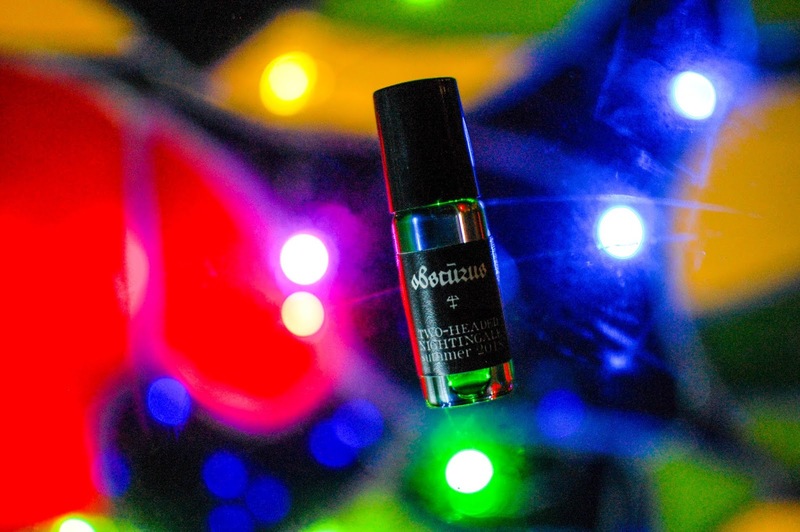 Madame Fortune ends the evening smelling of amber and dried tobacco, woody and dry. Her work done for the night, she twirls her wrist and the candles sigh their fire into smoke. 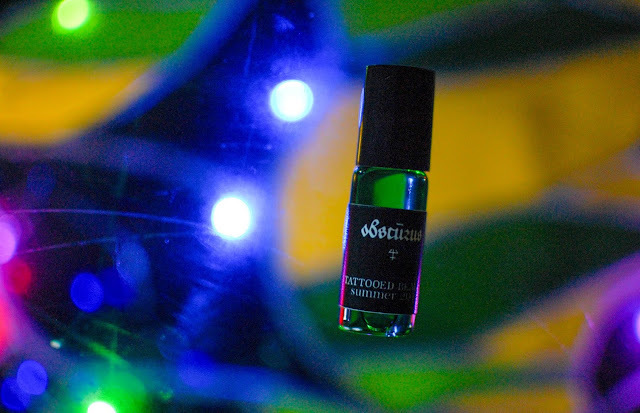 Cool watery lilies and black licorice twist in a narcotic arrangement that is mystical and intriguing. Unexpected yet beautiful. The black licorice liquifies from a spiced strand into a pool of darkness that allows the lilies to glow like ethereal moons on stalks, reflected in black waters. Musk pours out on the surface of the water like a tidal fog, drawn by the moons. The musk envelops the illuminated florals and they create a veiled glowing perfume that rests delicately on the skin. Museum Vrolik- Notes: Frankincense, cardamom, nag champa, aged leather, glass goblets and cold lights. Possibly the largest collection of human deformities in one place, the University of Amsterdam's anatomical and embryological museum began as the private teratological (the study of deformity, a popular subject for anatomists in the 18th and 19th centuries) collection of Gerardus Vrolik (1755-1859) and his son Willem Vrolik (1801-1863). Both were professors of anatomy. Leather, soft suede that ripples in waves of caramel and toffee colors. The lightest sugared cardamom speckles the draped leather for a moment, then the leather dries and ages with the help of arid resin and nag champa. The rawhide facets mellow as it settles down into a warm sienna embrace. A beautifully executed leather fragrance. 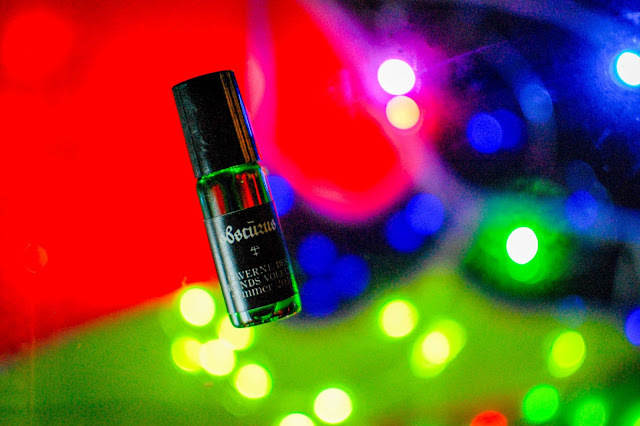 I have had great fun experiencing these well thought out and orchestrated scents. They wear close to the body with a moderate to low sillage which makes them ideal for work. The longevity is about 5-6 hours. I love them all but Carverne Des Grands Voleurs has my heart. That smoky patchouli is brilliant. 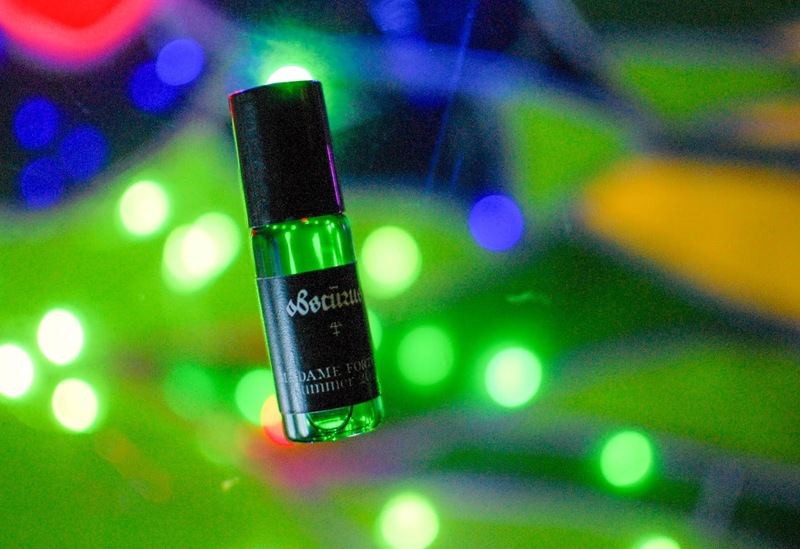 These carnival type scents are getting me excited for fall festivals. Do you have one you attend? Have you ever been to a wax museum or oddity attraction?